In Episode #1 of the November 2016 series, we took a look at the prices of all 35mm Full Frame Digital Cameras… In Episode #2, we took a look at APS-C DSLRs… In this post (Episode III), we take a look at prices of mirrorless cameras. As usual, we do not include rangefinders in this category, and we do not include sensors larger than 35mm since those are very niche (but we saw action there too with the Fuji medium format GFX 50S). 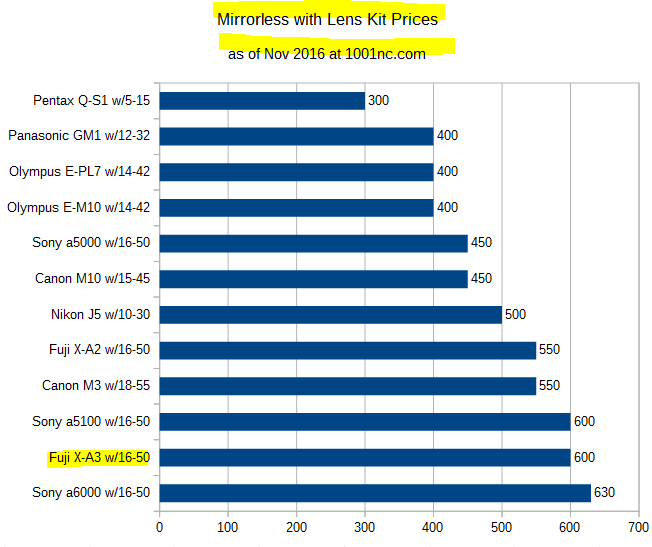 The prices are the consensus prices between Amazon and B&H Photo and Adorama as of November 2 in 2016. These are new condition with USA warranty prices, from authorized dealers. Prices are the body only kit, except for cameras without an official body-only kit – we use the lowest priced standard kit (eg w/18-55) for those. Older cameras that are no longer available in new condition with USA warranty from the above retailers, or are available in a very limited fashion, are not included. Leica price-leads the way and with that price, it will remain a champion until the next Leica camera. 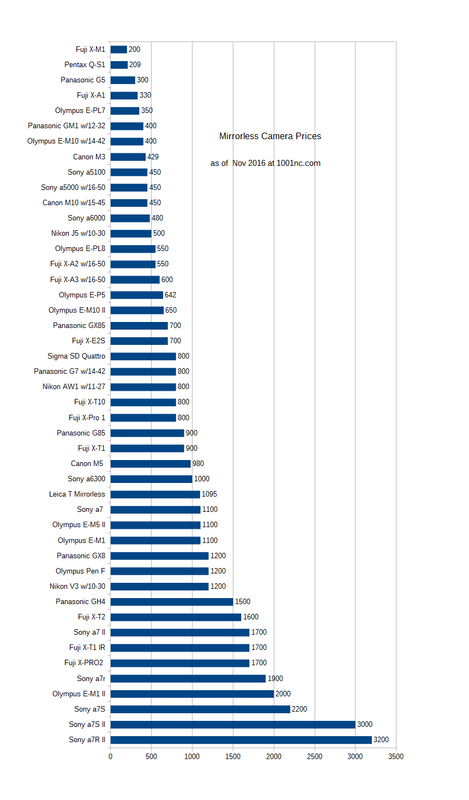 Sony’s price-flagship having the 35mm full frame sensor is also guaranteed a second place. Olympus played price-leapfrog with the E-M1 II, whose price was revealed a few days ago [see Stock Status Tracker] jumping ahead of Fuji’s latest entries. The Panasonic GH4 and Nikon V3 remained the same flagships as last year. Click on the image twice to see it at maximum size (unless you are on a giant vertical monitor) or open the full size PNG file (fear not, it’s only 55K, it won’t eat up your mobile data). Just like with DSLRs, the race to the price-bottom is over. Most of the sub-$400 cameras are older. 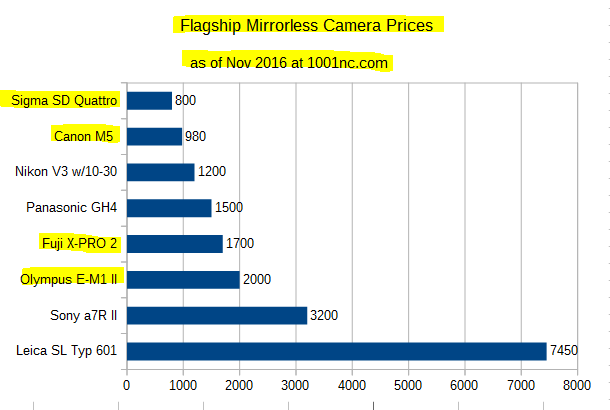 As usual with these charts, we feature the body only price, unless a particular camera does not have an official body-only kit. In those cases, we feature the lowest priced kit (most of the time it’s the w/14-42 or w/18-55 and such). This is why you see some cameras in the chart with lenses next to their names. To save the chart from being totally unreadable, I removed the Leica SL Typ 601, which you can see in all its price glory in the Flagships chart at the top. Its price flattened almost all the other entries in the cart. Taking a bird’s eye view, shows a steady progression of prices from $200 to $2200, so anyone buying specific price points, won’t have trouble finding something 🙂 This kinda feels healthy and organic – I think. Body only options are great if you already have lenses or if you are a serious/advanced photographer and you are planning to buy non-entry-level lenses. But for a beginner or someone dipping their toes into a new system (without taking a big financial risk), the “Take Pictures with Kits” (TPwK) are important, since you are ready to take pictures. Some of the cameras that are listed as Body Only in the mega chart above appear here with their kit lenses. This only covers lower prices, where TPwKs are more relevant. Under $650 is the cut-off point, which is why there’s only one new camera (yellow highlighter). Again, as you can see above, the race to the price-bottom days are over, so for someone looking for lower prices, the used/refurbished market may be an option to look at. Wow! What an excellent resource. Very clear, very well done. It’s also handy for future reference of this compilation and comparison with previous years. thanks! I’ll try to do some comparisons and see if there are patterns. I didn’t want to hold off posting these, because Black Friday is coming earlier this year (just three weeks away already!) and if I don’t finish this week, then the next window would probably be the last week of December.